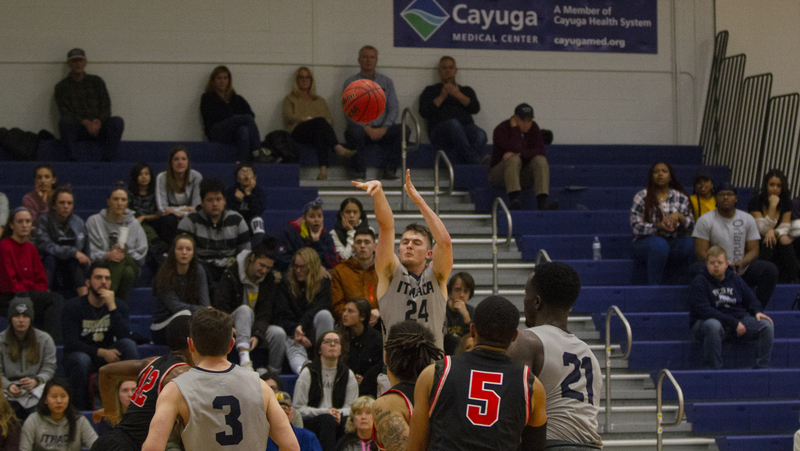 The Ithaca College women’s basketball team defeated Clarkson University 69–44 in a Liberty League matchup on Feb. 8 in Potsdam, New York. The win propelled the Bombers to an 18–5 record, with a 13–3 mark within the conference. The Bombers controlled the pace of the game, as they held the lead for more than 75 percent of the game. The first quarter was close, as the score was tied three times and the Golden Knights held a lead at one point, but the Blue and Gold left the quarter with a 16–12 lead. The second quarter was where the South Hill squad took over, ending the half with a comfortable 31–21 lead. The charge for the Bombers was led by senior guard Sara Jackson, junior forward Cassidy O’Malley and sophomore guard Grace Cannon. The Golden Knights held ground in the second half, but could not give the Blue and Gold too much of a scare. They cut the lead to single digits, but the Bombers were simply too strong for the Clarkson defense, and carried their momentum to the 25-point margin of victory. The Bombers’ key to success was in rebounding, as the team annihilated the Golden Knights on the boards, with a 44–24 advantage. The South Hill squad was led by O’ Malley, who netted 17 points. Cannon contributed 14 points and seven rebounds, while junior guard KellyAnne O’Reilly added 10 points, including two three-pointers.